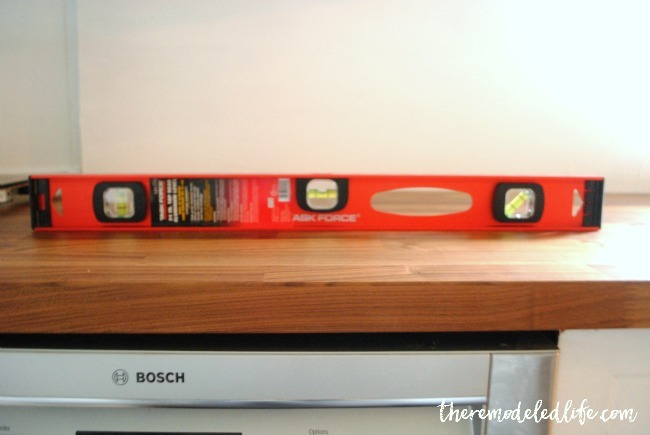 I'm excited to continue sharing more of our little diy kitchen remodel today. Last week I shared about the demo and prep process so today its getting into more of the fun stuff - installing the countertops! Since moving in to our home almost 5 years ago I have been researching different counter options. 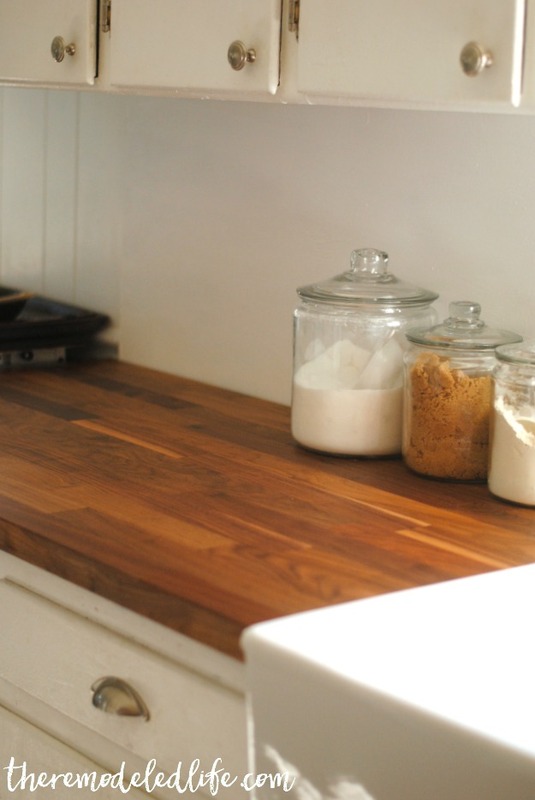 I went back and forth with the whole butcher block idea but ultimately decided it was a great choice for us. To keep the costs down we are not replacing our cabinets (just painted them) and we wanted to install the counters ourself - butcher block just made the right fit. Ikea has some great options and really great prices so we went with the karlby counters in walnut. The installation process was pretty straightforward for us. We really just needed two cut pieces, plus the sink notches cut out (more on that later). 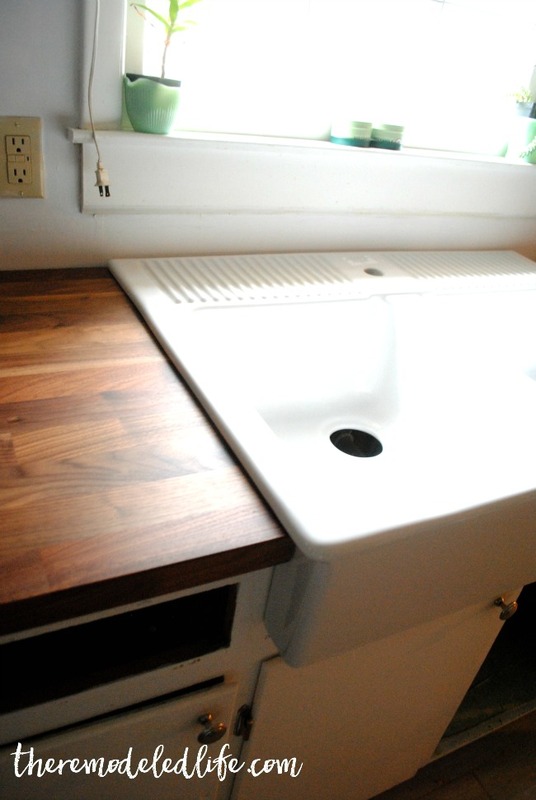 To keep things even more super simple we also chose the domjso farmhouse sink. This sink sits on top of the counters so any cuts we made would be covered, kind of perfect for first time kitchen installers. 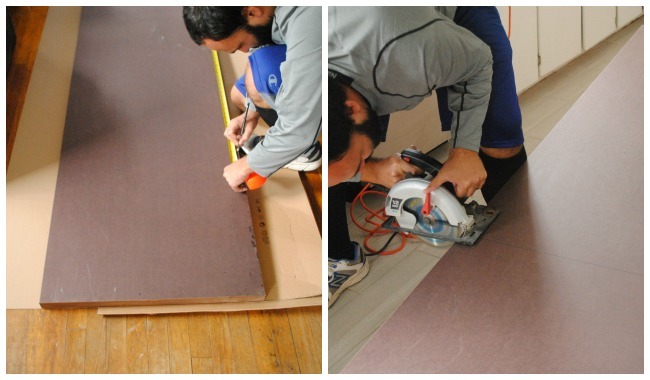 The countertops come in two sizes - we needed two of the larger size to make it work. So we measured our cabinet length and got ready to cut. I should say too that we also had the sink out and did a lot of measuring the sink and cabinet lengths - it is nerve racking to make a big cut on something you only have just enough of. So when we felt confident we went for it. It was a nasty weather week (so-much-rain) when we got into this so we had to do it all inside - this picture looks deceiving but we did have the countertop raised off the floor while Justin was cutting it (also pay no attention to the lack of safety going on here). After making the big cut the moment of truth had arrived and we nervously placed the countertop in and held our breath - thank goodness it was correct! We did another check on the level to make sure it was all coming together right. Once we had the length cut we had to cut in notches for our sink (it won't fit without these). So we measured the area (a billion times) and made the cut. Here again, the sink will sit on top so no need for an absolute perfect cut. We cut the notch on both sides and sat the sink in to make sure it was correct - not that there was any fixing anything at that point. 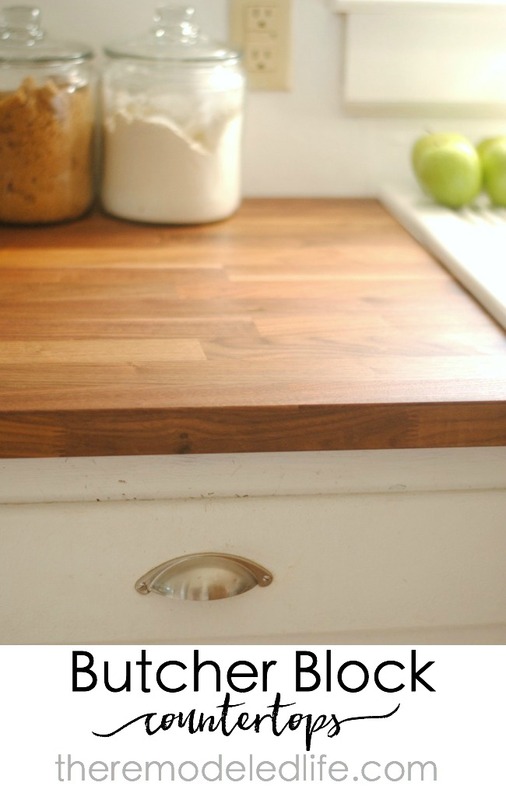 Oh and just a little tip - you need to measure both notches - the sink we had was not perfect and the notches were both a little different. So don't do one and think you can just use that as a template for the other side. I don't know why but that would not have worked for us. It was actually fairly simple and only mildly stressful. We really had an easy set up to work with. The final step in installation was fastening the cabinets underneath. It was just a few screws and bolts and now everything is in place and not going anywhere. I am so loving these counters. It fits the feel and look of our house so well. Counters = Complete!! 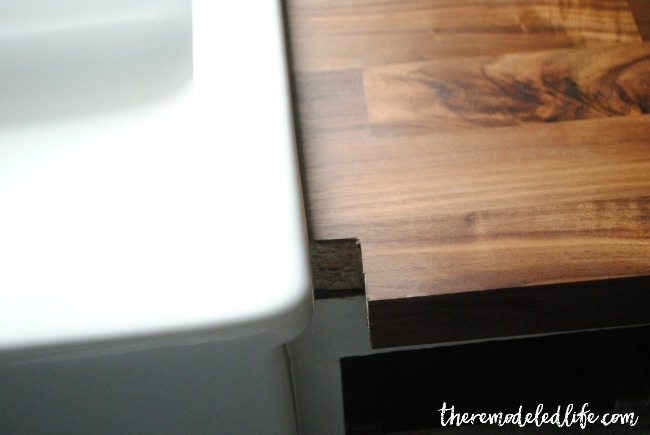 The next step of this diy process was our sink - and man, do I love it. 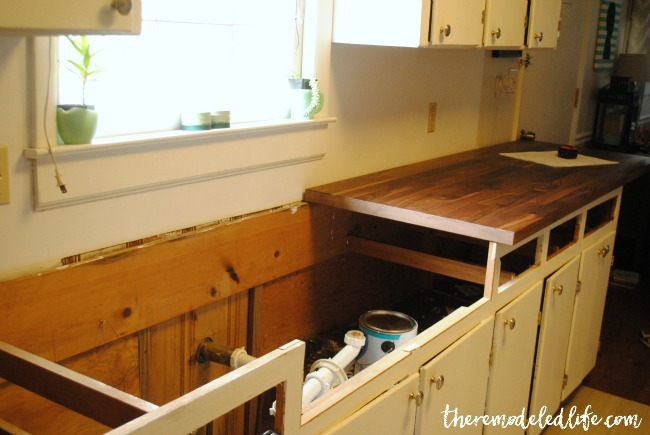 I'll share with you tomorrow how we made it work in our existing cabinets! Have a great Monday! Did you have any edges that were cut to size that left an open edge of particle board? I was looking at using this but i have a U shaped kitchen and a small 2 ft. section on one side of my stove. So once you cut to fit, what do you do about the raw edge of particle board?